Deputy Speaker Pays Last Homage to Former Defence Minister of India and a Tibet Supporter late Hon. George Fernandes at His Residence. On hearing about the sudden demise of Former Defence Minister of India and a staunch Tibet supporter, late Hon. 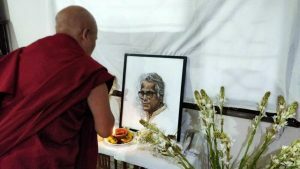 George Fernandes on 29 January, 2019 at around 4:30 PM, Deputy Speaker of TPiE, Acharya Yeshi Phuntsok, on behalf of Tibetan Parliament-in-Exile pays his last respect to him at his residence, Panchsheel Park, New Delhi and offered floral tribute and ceremonial scarf to his remains. He offered his condolence to late Hon. George Fernandes’s wife Smt. Leila Kabir, relatives and admirers. Along with Deputy Speaker of TPiE, Director of Indo Tibet Coordination Office (ITCO), Settlement Officer of Tibetan Colony, Majnuka Tilla, Local NGOs and Ladakh Bodhvihar’s Tibetan representatives were also present to condole the family members and offer tribute and traditional scarf to the remains of late Hon. George Fernandes. At the same time, Deputy Speaker also met with Tibet supporters and Indian Parliamentarians Shri. Dr. Arun Kumar, Smt. Meenakshi Lekhi and former personal secretary of late Hon. George Fernandes, Smt. Jaya Jaitley. 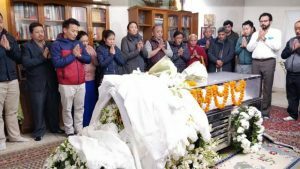 Deputy Speaker requested the local Tibetans to attend the funeral ceremony on 31st January.